Of the many known thirteen star patterns that exist, this particular pattern of twelve stars in a circular or oval wreath surrounding a single central star is one of the earliest documented American flag patterns. 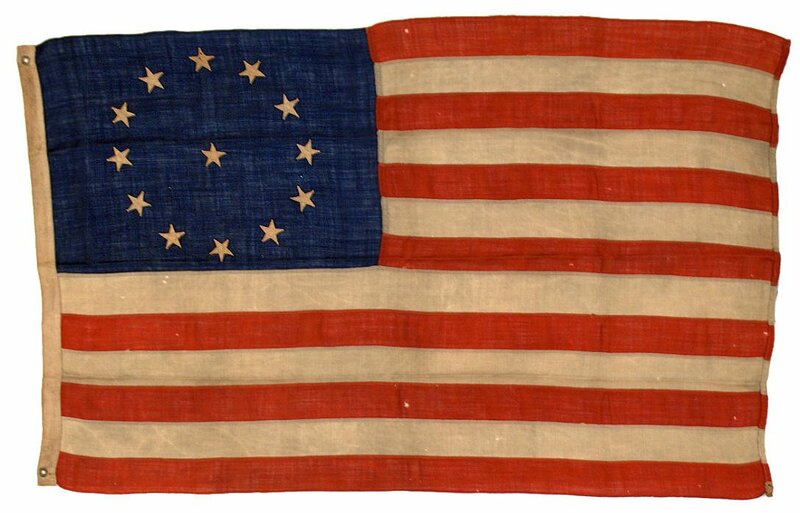 A version of the flag was reportedly carried by William Batchelor of the 3rd Maryland Regiment at the Battle of Cowpens, on January 17, 1781. 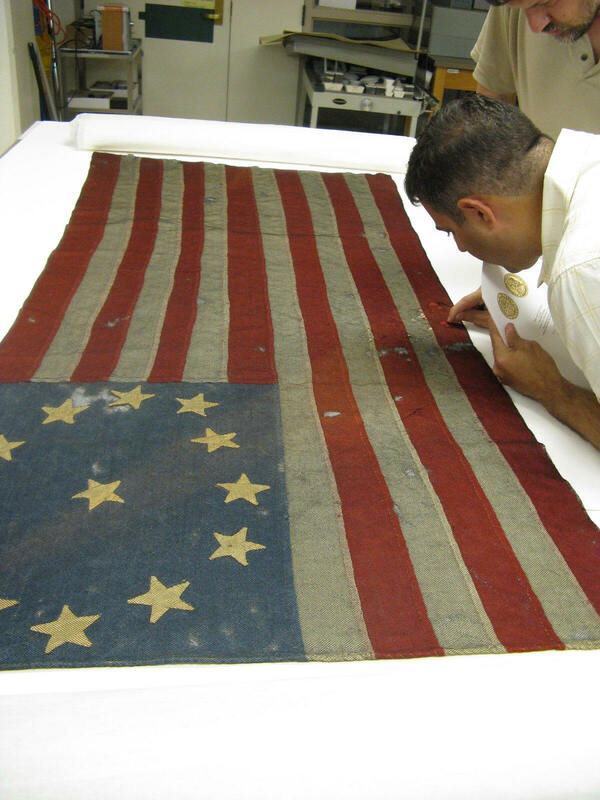 The original flag, known as the Batchelor Flag, is currently held in the Maryland State Archives. Its attribution as an 18th century flag is uncertain, but the pattern was known to have been used during the Revolutionary period based on paintings and drawings from that time. Regardless of a possible false attribution, the pattern is still known today as the 3rd Maryland or Cowpens pattern. It is one of the more rare patterns of 13 star flags, comprising less than one percent of antique thirteen star flags that survive. The rich coloration, exceptional condition and beautiful precision-placed stars on this flag elevates its beauty even among other examples of this very rare type. In addition to its desirable pattern, another particularly rare attribute of this flag, which allows us to date it precisely to the year 1904, are the words "St. Louis World's Fair" stamped lightly on the hoist. The St. Louis World's Fair, also known as the Louisiana Purchase Exposition, was the largest international fair held to date and was also the venue for the 1904 Summer Olympic Games. Although most thirteen star flags of this later period were made for maritime use, this flag is evidence that they were also made to be used on land. The flag may have been made by a company showcasing their manufacturing and wares and sold as a souvenir, or it may have hung at the World's Fair on or in one of the exposition buildings or galleries. Today, this rare flag remains a stirring expression of patriotism and an excellent example of how Americans continually produce and fly historic flags in later periods to celebrate our nation's history. Learn more about methods of creating stars.